Polavaram Irrigation project has achieved an overall progress of 53 per cent, CM Naidu told. 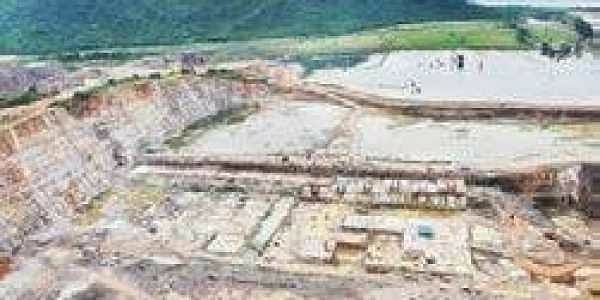 VIJAYAWADA: The State government, which spent Rs 7,070 crore on Polavaram project after it was declared as the national project, is yet to get Rs 2,147 crore from the Centre towards reimbursement.Though, the total amount spent on Polavaram project stood at Rs 12,910 crore, the State government will get reimbursement of the funds it spent after the project was declared as a national project. As the Centre had already reimbursed Rs 4,932 crore, the State government now will have to get the remaining funds. Disclosing details to newsmen at the Interim Government Complex in Velagapudi on Monday, Water Resources Minister Devineni Umamaheswara Rao said that the government spent Rs 5,135 crore on Polavaram before it was declared as national project.Reiterating that the government will complete the project in 2019, he said that the State government is ready to answer every question relating to the Polavaram project. Engineer-in-Chief M Venkateswara Rao said that all the details regarding Polavaram project are available in the website -- polavaram.apegov.com. History of the project, present progress of works, expenditure made so far and all other details were uploaded in the website, he said. He also said that details of the virtual inspections conducted by Chief Minister N Chandrababu Naidu at the project on several occasions, minutes of the weekly review meetings, project status updates, details of relief and rehabilitation, orders released by the government, answers to frequently asked questions and contact numbers of officials, engineers and contractors are regularly updated on the Polavaram and the Water Department websites, he said. During the meeting with the Chief Minister, officials explained him that Polavaram Irrigation Project has achieved an overall progress of 53%. During the review meeting on Polavaram and other irrigation projects, the officials told the Chief Minister that 71% of the excavation for the spillway and spill channel has been completed, i.e., 775 lakh cubic metres out of 1,055 lakh cubic metres. 30.57% of the concreting for the spillway and the stilling basin is completed, accounting for 5.01 lakh cubic metres out of 16.39 lakh cubic metres. Overall, 39% of the head works have been completed. Other main components of the dam that have shown consistent progress are the diaphragm wall (68%), radial gates (58%) and the jet grouting for the Cofferdam (78%). The Chief Minister also asked the contractors in charge of the Left Main Canal to ensure faster progress, and asked for a detailed plan and date of completion by next Monday. The Chief Minister asked officials to complete the Mallemadugu Reservoir by June 2018, which was initially going to be ready in August. He requested Forest department officials to approve all the required clearances for Sri Balaji Reservoir, Venugopala Sagar Reservoir and Veligonda Project.